What is a 'bike hub'? Many progressive local authorities in Britain aspire to create ‘bike hubs’ or have actually created them. But many people remain confused and some have contacted the Krapp Institute for advice as to what exactly a ‘bike hub’ is and where they can find one in their area. A few exceptional local authorities such as the London Borough of Newham helpfully sign the existence of ‘bike hub’ routes, as shown above on the legendary Newham ‘Greenway’ (middle section closed until late 2014 – please obey the CYCLISTS DISMOUNT signs before following the diversion onto the six-lane Formula One racing circuit). The Newham Greenway connects the cycling-friendly Stratford urban motorway gyratory with the cycling-friendly Becton urban speedway network. On this lonely, windswept route cyclists have an exciting opportunity to experience life in the East End. On the Greenway cyclists can also enjoy traditional cycling infrastructure, which is ‘dual use’ and may also be used for sheep-shearing and to halt stampeding herds of buffalo. Please note that the Greenway gates make this route unsuitable for those riding cargo bikes, trikes, bikes with panniers, or towing trailers. A maniac driver who ploughed into a pedestrian and left him to die in the street after jumping a red light was 'in a hurry' to drop off his mother's passport at the airport. Today Khan of Bury, Greater Manchester was starting a two-and-a-half year jail sentence after being convicted of causing death by dangerous driving. Khan admitted failing to stop at the scene of a collision, failing to report a collision and driving without insurance. He was also banned from driving for five years. This short driving ban is not the whim of a car-centric judge. The judge is simply obeying guidelines set by this very obscure and unaccountable collection of individuals. (Above) The first rule of learning to drive is that cycle lanes like these can be parked in quite legally seven days a week, at any time. This is the London Cycle Network, in which lots of small blue rectangular signs guide cyclists from one crappy, car-sodden location to the next one. Leyton Green Road. (Below) A learner driver is instructed in the art of parking correctly in an ASL. Snaresbrook Road. (Below) This probationer has passed her driving test and has understood the importance of driving into an ASL at red. Traditional cycle campaigning in the UK is committed to improving the lot of vehicular cyclists in a motorised environment. Historically, this strategy has been a catastrophic failure in terms of boosting modal share. As every survey ever taken has shown, and as even most campaigners admit, fear of traffic remains by far the greatest deterrent to new and returning cyclists. Maintaining our right to cycle on any road (other than motorways) must always be a top priority, for if we lose that right we can have no expectation of being treated any better elsewhere. I'm pleased that most of the cycling community is united on this, but there have been exceptions and I think that this has fuelled the 'cycling is dangerous' myth that invariably leads to calls for cycling to be restricted. 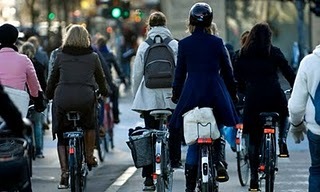 I also think that in the UK there remains a general recognition by the public at large that cyclists ought to be on the roads and we need to reinforce that perception and not weaken it. On the one hand campaigners believe that the non-cycling majority must be persuaded that cycling is safe, that the more people who cycle the safer it gets, and that nervous individuals can be taught to cope through the medium of cycle training. But that still leaves the question of what to with motorists. As many cyclists have noticed, there are quite a few drivers out there on the roads whose driving standards might be deemed antagonistic to cycling in various ways – even, you might say, dangerous. Anti-social behaviour by cyclists undermines other efforts to develop cycling in Redbridge and creates conflict with other road users. Through engineering, education and enforcement, a mutual awareness and respect between cyclists, pedestrians and other road users will contribute to increasing the attractiveness of cycling. The crossing at Kenley Road is a sheep-pen affair with a cycle time so long most people don't bother waiting. However, a more mainstream argument within the vehicular cycling campaign community is that the behaviour of drivers must be directly addressed. There are, it is argued, three ways of doing this. The first one is through ‘education’. Many people are campaigning for better provision ON THE ROAD and educating drivers to be safer around cyclists. You have to admit that if cycling on the road was safer then there would be no/less need for segregated cycle routes. (Above) This Isuzu Trooper driver parks in the cycle lane and pops into the bank. R873 SOY. At the same time, just across the road (below) this Jeep driver parks their 4X4 both across the cycle lane and on the footway, to visit the school uniform shop on Hoe Street, E17. Reg. PG02 XPK. The second one is new legislation to change driver behaviour. We recognise the role that good quality infrastructure has to play, but we feel that the elephant in the room is driver behaviour in the UK – something that has been addressed almost everywhere else in Europe but not here. "stricter liability" laws which mean that Dutch and Danish drivers really do respect the priority of cyclists using cycle tracks at junctions. There’s nothing wrong in principle with ‘strict liability’ legislation, but it has nothing at all to do with driver behaviour (and as I have previously argued, it is often misinterpreted as referring to criminal law). 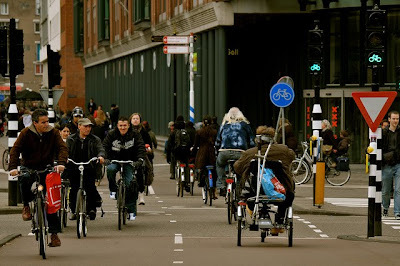 In reality Dutch drivers behave better to cyclists because they are virtually all cyclists, unlike Britain where two drivers out of three never cycle. ‘Strict liability’ was not the catalyst for mass cycling in the Netherlands – infrastructure was. The legislation came much later. The significant variations in modal share within both the Netherlands and Denmark are down to infrastructure, not legislation affecting insurance matters for drivers involved in collisions with cyclists. danger from motor traffic – particularly to the non-motorised – is characterised by official tolerance… enforcement and sentencing policy for the majority of rule and law breaking driving [is] non-existent or lenient. Compared to Health and Safety at work, maritime safety, aviation safety or rail safety, regulation of danger on the road is much more likely to be based on a “voluntary code” which involves accepting behaviour which endangers other road users. The third proposal for changing the behaviour of British drivers is to make cycling part of the driving test. This is the CTC’s latest frothy enthusiasm. This would create a generation of bike aware drivers whose experience of cycling in traffic would make them better disposed to accommodate their more vulnerable brethren. Oh yeah? Since when did passing the driving test have any influence on the subsequent behaviour of drivers? There is none whatsoever that I know of. The idea that making learner drivers spend time cycling in traffic would create generations of cycling-friendly drivers is just the kind of crackpot delusion that appeals to establishment cycle campaigners. Their top priority remains cycling in traffic, and the demonstrable and continuing failure of this campaign strategy matters not a jot. There is a deep rooted, unquestioned assumption here namely that the key cycling skill is about dealing with motor vehicles. The argument becomes a circular one; the skill that matters is dealing with motor vehicle traffic, ergo anything that reduces the relative significance of that skill is undesirable. And of course even if we had more niceness by drivers, with lots of lovely posters reminding them to watch out for cyclists, and strict liability legislation, and cycling part of the driving test, these would have no impact whatever on volumes of traffic or car dependency. You would still be left cycling on streets like these. (Below) Conditions for cyclists in the car-sick 'Biking Borough' of Redbridge. A113, Wanstead. Richard Lewis is a principal town and transport planner at the London Borough of Newham. The key thing in any event, it seems to me, is good design of public spaces. And now let’s look at the latest development of public space in the London Borough of Newham. Cyclists using the traffic-free Olympic Greenway are currently diverted off it down Pudding Mill Lane (and will continue to be until 2014). You emerge on to the A11 (above), which is little more than an urban motorway. Traffic is screaming towards you downhill from the Bow flyover. There is no infrastructure for cyclists at all. This is supposed to be a future Cycle Superhighway route but Newham Council is currently blocking implementation of even this type of infrastructure. The footway here is very wide, pedestrian flow is very low, and the scope for a segregated Dutch cycle path is blatantly obvious. But in this refurbished street scene cyclists get nothing. And the notion that cycling is going to grow exponentially in these kinds of conditions is very optimistic. (Below) Obviously a cycle path wouldn’t be possible here because it might interfere with the crowds of bankers standing here deciding which new Porsche to buy from the showroom. And where better to locate a Porsche dealership than in one of the poorest boroughs in London, with very low levels of car ownership? Easy access from the A11. What struck me was the high levels of cyclists using the footway here (below) rather than mix it with lorry drivers and speeding 4X4 drivers on the urban motorway. So there you are, you see, it's all the fault of cyclists like these, acting in ways which stops cyclists winning respect. Westwood, 56, now of Woodgate Road, Stoke Prior, was banned due to totting-up because he already had nine points on his licence before an extra three points was added for the phone offence. The George Orwell prize for Double-Speak has been won this year by Waltham Forest Council. The judges paid tribute to ‘the Big Screen’ in the Town Square – twelve hours of continuous and compulsory TV babble. They were also impressed by the council’s decision to prevent local residents attending council meetings on the grounds that fire regulations did not allow full use of the public gallery. (Above) car parking on Charing Cross Road . It’s a shame the road is too narrow for a segregated cycle path innit. (Below) cycle parking on Charing Cross Road. (Below) This is where I like to park my bike when I’m visiting the British Museum (handy for the rear entrance). Woops! All the stands have gone. (Below) And these are the temporary cycle parking arrangements. By the way the air pollution in London is nothing to do with it being a car-sick, car-sodden city. Nah, it’s all the fault of foreigners. (Below) Princes Circus in central London (traffic approaching from High Holborn). As any top member of the London Cycling Campaign will tell you, there simply isn’t the space on London’s narrow streets to fit in the kind of segregated cycle paths they have in Dutch and Danish cities. And anyway we prefer safety in numbers and the right to ride. If you wait, some cyclists are bound to turn up. And here they come! Three cyclists. The male cyclist with the racy handlebars and bandana waits for the right moment to zip across at red. The two cautious helmeted women cyclists hug the gutter and wait for the lights to turn green. Of course in London the authorities shrewdly realise that if you start putting cyclists and pedestrians before car drivers, then the economy collapses. 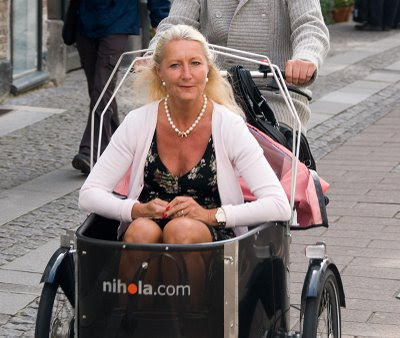 Like in Denmark, where this poor woman is reduced to being transported to the opera in the most humiliating way. Foreigners have no sense of shame, do they? Where the off-road cycle path turns into an on-road cycle lane on the eastbound A503 (Forest Road E17, at the junction with Spruce Hills Road). Tuesday, 3.30 pm. There was no one inside this taxi. The driver had almost certainly gone into the adjacent convenience store, which acts as a magnet for people parking here throughout the day. The Public Carriage Office (PCO) is responsible for administering the licensing of taxis and private hire services in London and acts on behalf of TfL, the Licensing Authority. And it doesn’t give a toss about licensed drivers who behave like this. Nuffink to do with the PCO. Outside its remit. And Transport for London is content to maintain this state of affairs. London’s roads are full of licensed psycho minicab drivers, who break the speed limit, cut up cyclists, drive aggressively, invade ASLs, block cycle lanes, blow their horns at cyclists who are delaying them, etcetera etcetera. These reckless anti-social yobs enjoy powerful institutional protection from the Mayor of London, Transport for London and The Public Carriage Office, none of which are the remotest bit interested in curbing the excesses of these drivers. And more good news for anyone thinking of becoming a minicab driver. Having a driving or criminal conviction will not necessarily prevent you from becoming licensed. A cycle lane in safe, cycling-friendly York. Gillygate, junction with Bootham. As any fule kno York is scientifically the safest place in England to cycle. And now here is the latest news from York. AN ELDERLY cyclist has been taken to hospital after a road traffic collision in Clifton, York, this morning. A YOUNG cyclist suffered head and leg injuries in a collision with a silver Nissan car which failed to stop at the scene. Police are looking for the driver, who stopped to check for damage to his vehicle, but did not speak with the 12-year-old boy or leave his details. seriously hurt in a collision with a motorbike near Stamford Bridge on Saturday. Two cyclists have died after being hit by lorries in separate accidents on the streets of London. A 20-year-old man, thought to be a foreign national, was killed when his bike collided with a skip lorry in Bermondsey early yesterday afternoon. Four hours earlier a male cyclist in his thirties died after being trapped under a lorry outside Lambeth town hall in Brixton. The skip lorry driver was arrested and taken for questioning after the crash in Bermondsey, which took place at the junction of Tanner Street and Tooley Street. Both the cyclist and the lorry were travelling in the same direction at the time and police say it is unclear how the collision occurred. Mayor Boris Johnson, came under criticism in October 2009 after deciding to withdraw Transport for London funding from the Metropolitan Police’s Commercial Vehicle Education Unit (CVEU), which inspected lorries in the capital, insisting that the voluntary Freight Operators’ Registration Scheme (FORS) provided an adequate safeguard. While the CVEU has been reconstituted by the Met as the Commercial Vehicle Unit, operating out of Alperton in North West London, it does not have the same scale of resources or manpower as it used to do. Yes, sections of the road haulage industry may be completely out of control but let’s face it the Met has other priorities. And in Parliament there is great vexation at one notorious road user group. In the meantime, don’t forget the LCC’s day of inaction. On 11 March I was cycling west on the A503, when this lorry emerged from the Town Hall. The driver was steering with one hand and talking on a handheld mobile phone. I caught up with the lorry at The Bell junction and took a couple of souvenir snaps of this encounter. I thought I’d get a pic of the numberplate. Except I couldn’t. It’s been unlawfully obscured. Also one of the brake lights on this lorry wasn’t working. The day before I was cycling along South Grove when I was overtaken by this J.S. Riney lorry. Riney work for the London Borough of Waltham Forest. The lights at the junction with Willow Walk changed to red long before the driver reached the spot. That naturally didn’t deter him from driving into the cycling ASL. Billet Road E17 (B179) is a wide, fast road that links the Crooked Billet interchange (where the North Circular meets the A112, the main north-south route through Waltham Forest) with Blackhorse Lane and Blackhorse Road station. It’s a very unpleasant road to cycle on because large numbers of drivers are plainly going much faster than 30 mph, and you have the intermittent risk of ‘dooring’ or being cut-up at mini-roundabouts. The council decided to develop an off-road cycle path for cyclists heading west from the Crooked Billet along Billet Road – a path previously celebrated by this blog here. Lately this risible piece of infrastructure has been extended, to the point shown above. It reallocates half the footway for cyclists. Naturally pedestrians take no notice and wander across into what is supposed to be the cycle path. The possibility of conflict with pedestrians is much increased, not least with anyone stepping out of their front garden. Meanwhile, alongside it, runs a road which is at this point four lanes wide. In what is a short stretch of cycle path cyclists have to give way for a road, a driveway and three bus stops. It's hardly surprising that off-road cycle paths have a low reputation in the UK when this is the rubbish which transport planners come up with. This dismal cycle path extension fizzles out at Monoux Grove, where cyclists have the exciting option of a signed ‘quiet route’ through back streets choked with parked cars and a one-way system where, to avoid dooring, you need to take the primary position, resulting in displays of extreme aggression from any boy racer or white van man who happens to catch up with you. If you choose to shun the 'quiet route' option and continue along Billet Road you will see at a glance that on London’s narrow roads Dutch-style segregated cycle paths just aren’t possible. To prove this I’ve compared the two. Any other way of arranging street space is unimaginable innit. THE father of a Barnet councillor has died after being hit by a car on a pedestrian crossing in Temple Fortune. Donald Salinger, 95, passed away three weeks after being hit by a car on a crossing in Finchley Road on February 6. Note that the driver who hit him was 82 years old. Fit to drive? The only person required to verify that is the octogenarian driver himself. A new emission from the Hammond Organ. The government's decision to rule out lowering the legal drink-drive limit has been criticised by doctors and road safety campaigners as "bitterly disappointing" and a wasted opportunity to save lives. Hammond said toughening up enforcement rather than lowering the limit was the key to tackling those drink-drivers who "flagrantly ignore" existing legislation. Ah, yes. And there’s the promise of a higher speed limit. This, too, will be rigorously enforced. A DEESIDE woman who set up a support group for people affected by alcohol has admitted driving when nearly four times the legal limit. One of the central themes of this blog is that for cycling and walking things are getting worse, not better. Well, they are in the London Borough of Waltham Forest. Here are some photographs of two streets where footway parking used to be banned. Now, in the name of ‘regeneration’ and ‘smoother traffic flow’ see the results. The photo above and the two below show Wood Street, Walthamstow. In the name of ‘regeneration’ the footway has been seized for car parking. Naturally once you allow footway parking, some drivers park in the areas they aren’t supposed to. Instead of re-arranging street space to benefit cyclists and pedestrians, Waltham Forest council is doing exactly the reverse – promoting increased car ownership and use at their expense. (Below) Wingfield Road E17. Parking on the footway used to be banned. But as car ownership grew and filled both sides of the street this created problems for larger vehicles. Instead of solving this at the expense of the parked vehicles, the Council decided that pedestrians would have to pay the price. A dashed white lane was painted just beyond the kerb. You can see how well this has worked out. Philip Scarff, 37, from Shelland, suffered fatal head injuries in an accident on Old London Road, at Copdock, Ipswich, on August 27 last year. ...it was not clear how fast the 4x4 was travelling or where the impact took place. If the 4X4 had been fitted with a black box data recorder we would have the answer to both those conundrums. But the car lobby have successfully resisted fitting such data recorders on the spurious grounds of cost. Has the cycling lobby, such as it is, ever made this a demand? Or is everyone too busy defending ‘the right to ride’? Suffolk coroner Dr Peter Dean ruled Mr Scarff’s death as accidental and said that there was nothing Mr Clint could have done to avoid the collision. Dr Dean’s bland summing up strikes me as being incoherent and contradictory. If we don’t know the circumstances of the crash or the speed of the driver, how can anyone logically conclude that there was nothing the driver could have done to avoid the collision? And was the cyclist hit from behind? The report doesn’t say. The NHS is a diseased organization with extraordinary levels of car dependency among its management and staff. so much NHS ‘support’ for cycling is mere lip service. There is no overall promotion of sustainable transport in the NHS and many Trusts neither know nor care what cyclists need. On busy or narrow roads don’t cycle next to another person. Make sure you’re visible to other road users and pedestrians. Keep away from the kerb, wear bright or fluorescent clothing in daylight or poor light. Always wear a helmet as this reduces the risk of head injury if you’re in an accident. The NHS colludes with motor danger and the car-centric status quo and demands that cyclists adjust their behaviour to it, not that the source of the danger be removed. Ironically the safety tips website is illustrated with a photo of three cyclists alongside lethal railings. Why isn't the NHS demanding that the street environment be designed to benefit the benign road user groups? Which brings me to the shabby, depressing and profoundly car-sick St James’ Health Centre in Walthamstow. Just wandering around this building made my spirits sink. We are a eight doctor practice 3 males and 5 females. We also have a Nurse Practitioner, 2 Practice Nurses and a Health Care Assistant. The practice is car-sick to its core. It is situated by a train station and a bus station but contains no advice on how to get to it other than by car. It contains no cycle stands at all. I counted 32 cars in the car park on a weekday last week but perhaps the extra ones were visiting health professionals. How many of these vehicles had been driven distances of less than 5 miles? Probably most of them. How many had been driven less than 2 miles? Quite possibly more than half of them. And why not? Unlimited free car parking is a great incentive to car dependency. We are proud to be recognised both as a Teaching Practice for Undergraduate Students from the Royal London and Barts & Royal Free/University College London Medical Schools and as a Post Graduate Training Practice for GP Registrars. (Below) Visitors arriving with prams or buggies are advised to lock them to a railing outside the entrance. Advice which is unlikely to be followed, since no one I know who pushes a pram or buggy ever carries a padlock and chain around with them. There’s plenty of space by the entrance to the health centre for bike stands, if anyone working here had ever heard of those quaint devices. Naturally the pram parking area has no protection from the rain. (Below) Judging by the architecture, this health centre opened in the 1960s. And in all that time no one has done anything about this kerb by the entrance, which presents a major obstacle to anyone in, or pushing, a wheelchair. The management of this practice really is stupefyingly mediocre and the doctors who work here should be ashamed of themselves for their lack of insight into the needs of those with a mobility difficulty, apart from their indifference to anyone who chooses to arrive here by bicycle.